Just a quick note to let everyone know that our latest book, Nocturnal Origins, is now available. Nocturnal Origins takes you to a Dallas that might — or might not — exist. After all, does anyone really know who or what lurks in the shadows? Investigating one of the most horrendous murders in recent Dallas history, Mac also has to break in a new partner and deal with nosey reporters who follow her every move and who publish confidential details of the investigation without a qualm. Complicating matters even more, Mac learns the truth about her family and herself, a truth that forces her to deal with the monster within, as well as those on the outside.But none of this matters as much as discovering the identity of the murderer before he can kill again. Nocturnal Origins is available for purchase from our website and will soon be available from Amazon and Barnes & Noble. For more information, check here. Some things can never be forgotten, no matter how hard you try. The memory remains, forever imprinted on your soul. It colors your perceptions and expectations. It affects everything you say and do. It doesn’t matter if the memory is good or bad, full of life and love or pain and death. That memory remains until the day you die – if you’re lucky. If not, the memory haunts you for all eternity. Detective Sergeant Mackenzie Santos knew that bitter lesson all too well. The day she died had changed her life and her perception of the world forever. It didn’t matter that everyone, even her doctors, believed a miracle occurred when she awoke in the hospital morgue. She knew better. She knew she had died. It hadn’t been a miracle. At least not a holy one. Ask the poor attendant who’d run screaming from that cold, desolate room in the hospital basement, when Mac had suddenly sat up, gasping for breath and still covered with too much blood. He’d been convinced a demon from Hell had risen to come for him. Mac couldn’t blame him. As far as she was concerned, that was the day the dogs of Hell had come for her. Now, standing in the alley behind Gunn’s, one of the most fashionable restaurants in Dallas, Mac closed her eyes and prayed . She suspected what lay ahead. She could almost smell it – not quite, but enough to know what was there. Sweat trickled down her spine and plastered her thin cotton shirt to her back. Her stomach lurched rebelliously and she swallowed hard against the rising gorge. She had to keep control. At least for the next few hours. Easy, Mackenzie. Just take it slow and easy. She opened her eyes and drew a deep breath. She knew it was bad. Two uniformed officers, hands on knees, vomited into the gutter. There were no black humor jokes, no conversation, nothing. In fact, other than the sounds of retching, the scene was eerily quiet, so it felt almost like a dream. A nightmare. She took a few more steps. The harsh, unmistakable stench assailed her nose, warning her what she’d find. Unless the restaurant had dumped several hundred pounds of raw hamburger out to spoil in the summer heat, a dead body lay at the far end of the alley. That was bad enough. Then she felt as though she were enveloped in blood and her stomach rolled over once again. Jaw clenched, she stepped forward. Never before had it been so hard to approach a crime scene. Not even when she’d responded to her first dead body call a lifetime ago. She hadn’t hesitated then, not like this. But she was different now. She knew what sort of horror awaited her. She’d seen it before and it haunted her. Haunted her because it touched something in her very few suspected even existed, something she tried so desperately to hide. The beast within fought for dominance, called by the smell of blood, the sight of raw flesh. She mustn’t lose control. Not here and certainly not now. She blew out a long breath and slammed her mind shut to the horribly enticing sights and smells. Even as she did, the nightmare that had become the core of her existence clawed against her all too fragile self-control as it fought for release. Focus on the job, Mac. Just focus on the job. Finally, satisfied she wouldn’t lose control – yet – she nodded once. It was time to get to work. Hidden deep in the shadows across the street, he watched and waited. Anger and frustration seethed just below the surface, held at bay only by sheer will power. He still couldn’t believe it. All his careful plans ruined. Now he was forced to lurk in the dark as he watched events unfold across the street. When he’d first scented the men approaching, he had cursed his foul luck. He wasn’t finished. His prey still lived. There had been so much fight in her, so much fear. How that thrilled him. Too much time had passed since he’d been able to play with his quarry as he had with this one. She’d fought desperately. Then she’d done everything she could to escape. Finally, she’d huddled in fear and begged for her life even as he continued to play with her much like a cat plays with a mouse just before making that last pounce followed by the kill. But it wasn’t to be. He had scented the men long before they reached the alley entrance. Their conversation warned him they were police. For one brief moment he’d actually toyed with the idea of killing them. Then memory of his last encounter with one of their kind intruded and forced him to admit the folly of the thought. Damn them all to Hell! He’d been forced to kill his prey before he finished with her. Worse, he hadn’t been able to feed off her. Instead, he’d slunk away like a carrion eater in the face of a stronger, meaner predator. How he hated that. He was no coward, no bottom feeder. He was the predator and yet here he stood, hiding in the shadows as they swarmed over his kill. That flew in the face of the natural order. He was stronger, more cunning. They should tremble in fear before him. Instead, he played the coward, unwilling to face their greater numbers or their guns. But they would pay. Sooner or later they would pay for being foolish enough, unfortunate enough to interrupt him. They’d pay the ultimate price and forfeit their lives. However, that had to wait, at least for a little while. Still, the night might not be a total loss. The circus across the street offered a potential show he’d not hoped to see. At least not yet. An almost feral smile touched his lips and he chuckled softly. He might get lucky after all. And all because of one woman, one tall, beautiful woman with a shock of dark hair and penetrating green eyes. His smile widened to a grin and his right hand fisted at his side as his heart gave an excited leap. That one woman had brought him such anticipation and then so much frustration. He could hardly wait until they met once more. It would be a meeting he planned to make their last. Two months had passed since he first laid eyes on her. Something about her had called to him, demanding he master her. So he’d set out to stalk her, confident in his ability not only to find her but also to make her his for as long as he wanted. What a wonderful plan it had been. Unfortunately, it hadn’t worked out quite the way he’d expected. She wasn’t like the others – men and women both – who’d fallen to him in the past. She’d proven to be as tough and determined as she was beautiful. When he thought he had her cornered and ready for the taking, she’d done the unexpected, the unforgivable. She’d fought back, leaving him wounded and forced to flee before she could summon help. She drew his attention once more. He could hardly wait to see how she reacted to his handiwork. Maybe, just maybe, the evening wouldn’t be a complete loss after all. 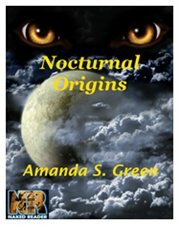 Nocturnal Origins will be on sale next month.